Up, away, and off they go! 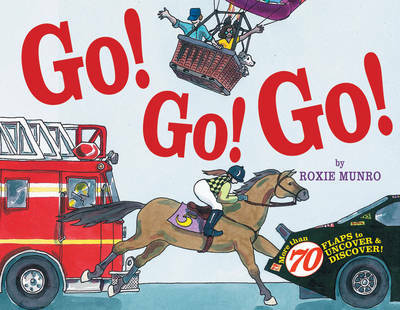 The great Roxie Munro has crafted one of the most elaborate, entertaining novelty books ever. Lift the flaps to see fire-fighters slide down the pole and pull out equipment; then turn the page to watch them battling a blaze. Or gaze as balloons fly high in the sky, a submersible plunges into the deep and race cars zoom around the track. Every page has lots of flaps to play with and plenty of colourful action captured in Munro's lively style. Two huge fold-outs add extra fun!